Teamwork. We talk about it, we read about it, and we do exercises to build on it. 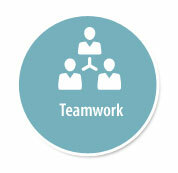 Teamwork is selfless and is a crucial part of any business or organization. When people collaborate, they work together toward a common goal. Teamwork means that coworkers try to cooperate with each other by using their individual skills and provide constructive individual input to solve the problem at hand, despite any personal conflict that may have existed between them in the past. When individuals work together and share their experiences and knowledge, they can come up with creative solutions. Since every employee brings unique skills, background and multiple viewpoints working together as a team helps their company become more innovative. It’s been my pleasure over the nearly 10 years that I have been employed here to witness firsthand the selfless acts of many of my co-workers (friends) People who have jumped in to assist wherever needed during crunch time or just because they saw a co-worker needing a helping hand. Truly blessed to work with such an awesome team. We have all heard these quotes which I did not properly cite, but what does it mean. 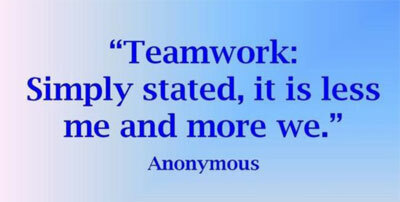 To me, teamwork is working together to get to a common goal or outcome. My daughter has it made by the help with my parents and a very generous person stepping up as a father figure. Without the village helping to raise her, I don’t even want to think about what situation I would be in. I know from my experience at SCC, we would not be successful without the entire SCC team. I would not be employed the sales/BDO team, Management, UW, NOA, RM, Cash..... We work together as a team whether it be direct or indirect. We have our individual teams, but we are all Team Sterling! GO TEAM GO! Teamwork means placing the success of the team first, and for the majority of organizations it is one of the most critical elements needed for success. I consider it to be a mindset - to think in terms of “we” and “ours” instead of “me” and “mine”...... and works best when it comes from the heart - to adopt the goals of the team as a vision; adopt the team as a family; to be motivated and even inspired by being part of the team; to value the bond among the members; and to believe in the power of working together. It is important for members to be placed in positions where their strongest skills are utilized and the SCC Partners have done this. At Sterling, I see examples of true selfless teamwork every day. It is evident in almost every communication.... folks offering to help no matter what the circumstances...offering encouragement...kindness...lifting each other up. It’s heartfelt and it’s the very best kind of teamwork there is! My favorite quote is Ken Blanchard’s. The combined action of a group of people, especially when effective and efficient”. I believe we have fostered an active culture of teamwork at Sterling. I see many examples of this on a weekly basis across all departments, people actively offering up help or assistance when other teammates are in need. Being a small company, we don’t have the luxury of vast or unlimited resources of human capital. When we have people off for vacation time, holiday schedules and unexpected absences we need to come together as a team to ensure our clients needs are being met without interruption, or as little interruption as possible. I believe we do a very good job in this regard, and it’s attributed to the team players we have that step-up and jump in to assist others when and where it is needed. Given our size and limitations of human resources, we would not be where we are at today without our culture of teamwork!